*you can be creative here and add whichever ingredients you like for example: beans (pre-soaked and cooked), spinach leaves (added towards the end of cooking), chickpeas, green beans or whatever is in season. In a large bowl combine very well all the ingredients for the meatballs. Season to taste (be generous because the seasoning will seep out of the polpette as they cook) add more nutmeg or lemon zest if you prefer. The mixture should be moist but hold its shape when rolled into meatballs. Form the meatballs to the size of a large walnut. You should be able to make around forty of them from these proportions. In a large pot heat up a couple of tablespoons of olive oil, add the onion, celery and carrots. Fry everything for about 10 minuets until the ingredients soften and the onion turns translucent. Now add the garlic clove and after a few minutes the potatoes. Give it a stir and after a few minutes cover the vegetables with warm water. Be careful with the amount of water, it should just cover the vegetables by 3-4 cm (you can always add more). Season with salt and pepper and bring to the boil. Now is the time to add the meatballs, one by one. The pot shouldn’t be overcrowded so choose it carefully before you start cooking. Put in the herbs secured with a cooking twine, lower the heat and carry on cooking stirring occasionally for a minimum of forty minutes until the meatballs and the vegetables are done. If you are using beans or chickpeas, you either cook them in the soup or separately, just be aware of the cooking time of individual ingredients. Leaves like spinach or chard should be added towards the end of cooking. 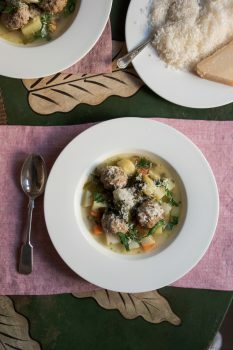 Serve the soup drizzled with some olive oil and grated parmesan cheese.